The Piazzale Michelangelo is a very popular viewpoint among tourists in Florence. It is about one kilometre from the centre, on the other side of the river Arno. Tourists come here to photograph the city of Florence from above. 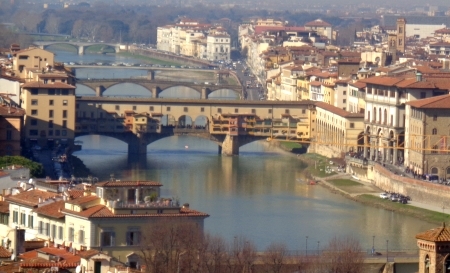 Also the famous bridge Ponte Vecchio can be seen from the square Michelangelo very well. On beautiful days in summer thousands of tourists come up to take photos and selfies. The typical view from Piazzale Michelangelo. You see the gigantic cathedral of Florence with the dome, on the left the tower of the Palazzo Vecchio and in front the river Arno. The view from Piazzale Michelangelo to the city is really breathtaking. In comparison to the other buildings, you first see how powerful and huge the cathedral is. It is one of the largest churches in the world with one of the largest domes in the world. The view to the river Arno and the old bridge of Florence (Ponte Vecchio) is also wonderful. On the square itself a statue is photographed just as often. It is the sculpture David by Michelangelo. It is, however, only a copy of the most famous sculpture in the world. Nevertheless it is a great photo motif. Michelangelo’s sculpture David on the square named after the famous artist. If you want to walk to Michelangelo Square from the centre of Florence, you need about half an hour. 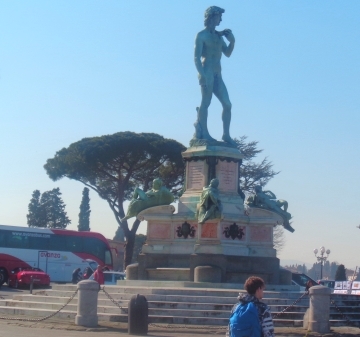 The Piazzale Michelangelo is the only sight described in this guide that is not directly in the old city of Florence. The best way is to go from the city centre of Florence over the bridge Ponte Vecchio and then to the left for about one kilometre along the Arno. Then you take a steep footpath up the mountain, away from the river Arno. You cross several times the serpentine road that also leads to the Piazzale Michelangelo on a much longer way. As there are a lot of tourists here, you can hardly miss the place Michelangelo. You simply always follow the crowds. Tours with the e-bike to the view point are also popular. Above we have seen that there are also some bus lines to the viewpoint. But we think that the footpath is worthwhile. From the Ponte Vecchio it is about 20 minutes on foot to the Piazzale Michelangelo. You can also go to the Piazzale Michelangelo on a tour like an E-Bike Tour Florence. 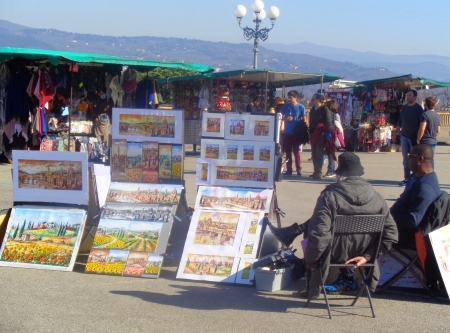 On Michelangelo square there are some souvenir dealers and artists who sell their paintings. 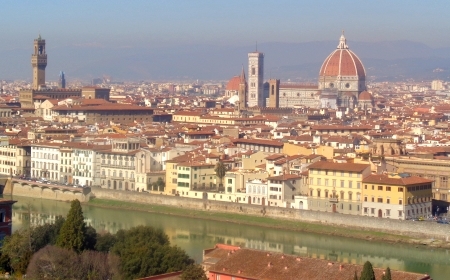 Many pictures show a panorama of the city of Florence. In addition, there are some snack buns that sell hot dogs, panini (sandwiches), drinks, etc.. Beside the Piazzale Michelangelo there is a beautiful park called Giardino dell’Iris (Garden of the Iris), which was unfortunately not open during our visit.